Two-term Town Council incumbent Tom Dunn has announced he will seek a third, four-year term on the Leesburg Town Council. Dunn formally announced his re-election bid this week, and has met all the requirements to be placed on November’s general election ballot. Dunn said the same thing that encouraged him to get involved in the community when he and his family first moved to Leesburg 18 years ago is what motivated him to run for a third council term. 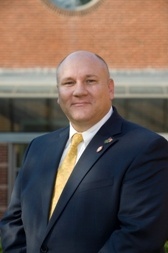 In addition to successfully running for the Town Council in 2008, and being re-elected four years later, Dunn has served on a slew of town, county and state boards and commissions; lead or volunteered with Scouting troops; coached Little League, youth football and flag football; and served as a tour guide for Ball’s Bluff Battlefield, to name but a few. He also ran twice for the mayor’s seat, challenging then-incumbent Kristen Umstattd, twice for the mayor’s seat, but was unsuccessful in both attempts. Professionally, he is the owner of VCR, Inc., a small marketing company located in Leesburg. For Dunn, a successful re-election bid will allow him to continue his mission of making sure to clamp down on wasteful spending and make sure the town is getting the county tax dollars it deserves for its services. He points to four goals if re-elected: implementing a better management process to more cost effectively deliver town services; correct major traffic chokepoints in the town, such as the area surrounding the intersection of Edwards Ferry Road and Rt. 15; enhancing public safety; and conducting a “definitive study” exploring the pros and cons should town leaders seek to make Leesburg an independent city. A large part of Dunn’s platform is focused on business recruitment efforts in Leesburg. More companies locating in the town will have a positive trickle-down effect on the local economy, he points out. Dunn plans a campaign kick-off, although no date has yet been set. For more information on Dunn or his campaign, go to electdunn.org. Dunn is part of a field of six running for a Town Council seat. He is joined by fellow incumbent Councilwoman Katie Hammler and challengers Ron Campbell, John Hilton, Gwen Pangle and Evan Macbeth. In the mayor’s race, current mayor David Butler is challenged by Vice Mayor Kelly Burk and former Town Council member Kevin Wright. And I won’t mince words either: Tom Dunn is the worst elected official that Leesburg has ever seen. The phrase “angry little man” is very applicable for Tom Dunn, as he has consistently stood for anger, nasty comments, and a steadfast refusal to work with anyone on the Leesburg Council, while at the same time insulting everyone. l I think this November, we will be seeing the last of Tom Dunn. Good to see at least one voice of reason is staying on Council.